Conventional white light endoscopy remains the current standard in routine clinical practice for early detection of gastric cancer. However, it may not accurately diagnose preneoplastic gastric lesions. The technological advancements in the field of endoscopic imaging for gastric lesions are fast growing. This article reviews currently available advanced endoscopic imaging modalities, in particular chromoendoscopy, narrow band imaging and confocal laser endomicroscopy, and their corresponding evidence shown to improve diagnosis of preneoplastic gastric lesions. Raman spectrometry and polarimetry are also introduced as promising emerging technologies. Gastric cancer is the third leading cause of cancer deaths worldwide.1 ,2 To decrease mortality, early detection and accurate diagnosis of gastric cancer through endoscopy is critical. 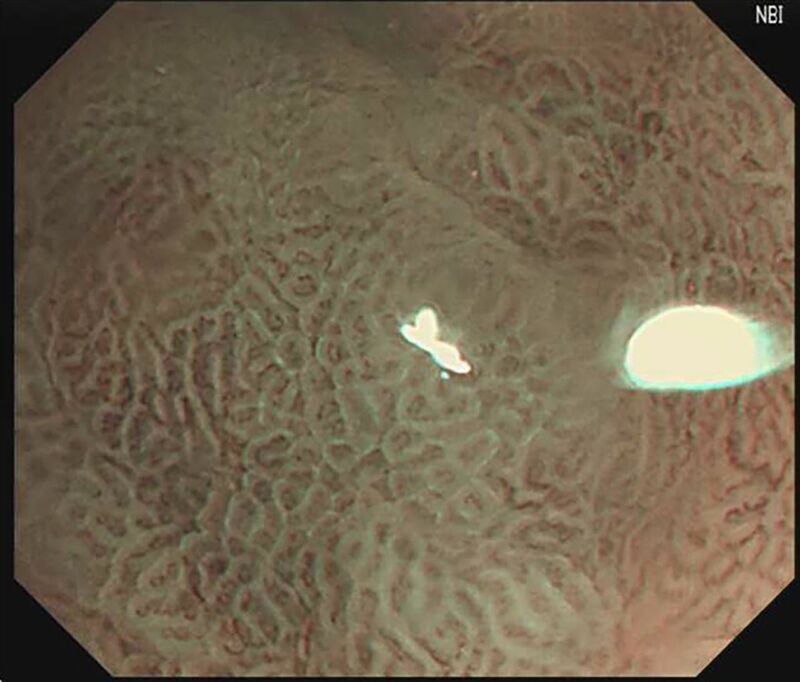 In recent years, despite numerous advancements in endoscopic imaging, conventional white light endoscopy (WLE) remains the fundamental step for detection and characterisation of gastric lesions in clinical practice. However, conventional WLE may not accurately diagnose preneoplastic gastric lesions. Hence, the European Society of Gastrointestinal Endoscopy (ESGE)3 has recommended the use of image-enhanced endoscopy, including magnification chromoendoscopy and narrow band imaging to improve the diagnosis of gastric preneoplastic conditions. This review aims to highlight the available image-enhancing endoscopic modalities to aid diagnosis of gastric adenocarcinoma and preneoplastic gastric lesions, which include gastric intestinal metaplasia and dysplasia. However, recent evidence for WLE to identify gastric preneoplastic lesions remain promising: Panteris et al8 demonstrated that real-time high-definition WLE (HD-WLE), during routine endoscopy practice, had an accuracy of 88% in identifying intestinal metaplasia; with sensitivity of 74.6%, specificity of 94.2%, positive predictive value of 82.5% and negative predictive value of 90.1%. In their study, all clinically significant type III intestinal metaplasia and dysplastic lesions were successfully detected using HD-WLE, whereas gastric lesions not picked up by HD-WLE were either mild grade or with no dysplasia. Furthermore, Xirouchakis et al9 also demonstrated that the use of WLE with adherence to the updated Sydney biopsy protocol (WLE-USP) had greater accuracy compared with narrow band imaging-targeted biopsies (NBI-TB) in detecting premalignant lesions; whereby accuracy for a diagnosis of atrophy and intestinal metaplasia were 93% and 90% for WLE-USP as compared with 82% and 80% for NBI-TB. Conventional CE incorporates topical application of dyes during WLE. An externally validated classification using CE was previously proposed by Dinis-Riberio et al,13 ,14 whereby CE with methylene blue, particularly with magnification, improves identification of gastric lesions. CE with other dyes,15–17 such as indigo carmine, acetic acid and haematoxylin, have also been shown to accurately differentiate between normal gastric mucosa and dysplastic or malignant gastric lesions. Zhao et al18's meta-analysis of seven prospective studies, comprising a total of 429 patients and 465 lesions, showed that CE improves the detection of early gastric cancer (p<0.01) and preneoplastic gastric lesions (p<0.01) compared with standard WLE. The pooled sensitivity, specificity and area under curve (AUC) of CE were 0.90 (95% CI 0.87 to 0.92), 0.82 (95% CI 0.79 to 0.86) and 0.95, respectively. Majority of the studies used indigo carmine (72.4%) instead of methylene blue (28.6%). However, the meta-analysis did not include a subanalysis comparing the application of different staining dyes. It is postulated indigo carmine is more frequently used, because indigo carmine is a non-absorptive contrast stain, whereas methylene blue has shown to be absorbed by oesophageal cells19 and colonocytes,20 thereby inducing cellular DNA damage on exposure to white light. AFI is an imaging method, applied during real-time endoscopy, dependent on the fluorescent properties of gastric mucosal particles, such as collagen, flavins and porphyrins, to differentiate between various gastric mucosa subtypes. On the other hand, Kato et al21 ,23 demonstrated an increase in gastric neoplasia identification from 18% (WLE) to 56% (WLE+AFI) by adding AFI to WLE during routine endoscopy. More subjects with intestinal metaplasia were also identified using AFI-NBI compared with WLE;23 whereby 68% with intestinal metaplasia (26/38) were correctly identified by AFI-NBI (sensitivity 68%, specificity 23%) compared with 34% (13/38) by WLE (sensitivity 34%, specificity 65%). Imaeda et al24 further demonstrated utility of AFI for detecting additional gastric lesions in patients with superficial gastric neoplasia postendoscopic submucosal dissection, whereby five gastric neoplasia missed by WLE were all detected by AFI. Owing to the conflicting data, the role of AFI in detecting and diagnosing gastric neoplasia and preneoplasia is unclear, and there is currently inadequate evidence to support its routine use in clinical practice. Application of CE requires additional procedure time and materials. Hence, various sources have introduced numerous user-friendly computed virtual chromoendoscopy techniques to improve visualisation of gastric mucosa tissue and vasculature, without the hassle of additional endoscopic probes or dyes. Such technologies include flexible spectral imaging colour enhancement (FICE) (Fujinon, Fujifilm Medical Co, Saitama, Japan), i-SCAN (PENTAX Endoscopy, Tokyo, Japan) and narrow band imaging (NBI) (Olympus Medical Systems Tokyo, Japan). Kikuste et al25 demonstrated good specificity (87%; 95% CI 79% to 95%) and diagnostic accuracy of 74% (95% CI 0.66% to 0.82%) using FICE endoscopy to detect gastric intestinal metaplasia among 126 patients aged over 50 years. In a study by Pittayanon et al,26 magnified FICE demonstrated an overall 85.5% accuracy in detecting intestinal metaplasia among 59 lesions in 45 patients, and the accuracy was higher with findings of light blue crest (95.2%) and long large crest (96.8%) and lower with findings of villous pattern (84.3%). In a meta-analysis by Kikuste et al27 seven studies were included for analysis; however, due to the insufficient data and varying definitions of neoplastic and preneoplastic definitions for FICE, there were no aggregate scores calculated. However, FICE did produce images with more pronounced colour contrast between malignant lesions and benign surrounding mucosa, compared with standard WLE findings, particularly in Osawa et al's28 study involving 82 patients with depressed early gastric carcinoma. Qi et al29 compared magnification i-Scan and magnification WLE in identifying type 2–3 gastric mucosal pit pattern, predictive of Helicobacter infection, whereby diagnosis was then confirmed by positive rapid urease test and positive histopathology. i-Scan provided better image quality with increased recognition of type 2–3 patterns, compared with magnification WLE, and thus increased accuracy of Helicobacter infection diagnosis (accuracy 94% vs 84.5%, sensitivity 95.5% vs 95.5%, specificity 93.5% vs 80.6%, positive predictive value (PPV) 84% vs 63.6%, negative predictive value (NPV) 98.3% vs 98.0%). A prospective study30 of 43 patients demonstrated modest results, whereby magnified i-Scan (with tone and surface enhancement) had a relative low specificity and PPV in diagnosing early gastric neoplasia (sensitivity: 100%; specificity: 77.1%; PPV: 50%; NPV: 100%; likelihood ratio: 4.37). These findings were mirrored by Nishimura et al,31 who looked at 10 patients with gastric neoplasia, and found no significant difference (p=0.78) between the diagnostic accuracy using either WLE (91.7%) or i-Scan (90.8%). Interestingly, in this study, the diagnostic accuracy of tumour size using i-Scan was comparable between novice and experienced endoscopists (65.7% vs 71.1%, p=0.53), whereas it was significantly lower for WLE (41.2% vs 79.5%, p=0.019), which may suggest that i-Scan technology will improve diagnostic accuracy of novice endoscopists. Owing to the limited data on FICE and i-Scan in the diagnosis of gastric preneoplasia and neoplasia and the absence of well-validated definition for gastric preneoplastic and neoplastic mucosal appearances, there is currently insufficient evidence to substantiate application of FICE and i-Scan in routine clinical practice for the diagnosis of gastric neoplasia and preneoplasia. A meta-analysis36 of 14 studies comprising 2171 patients, demonstrated a pool sensitivity, specificity and AUC for magnified NBI diagnosis of early gastric cancer to be 0.86 (95% CI 0.83 to 0.89), 0.96 (95% CI 0.95 to 0.97) and 0.9623, respectively. Gastric lesions of depressed macroscopic type and those with a diameter <10 mm had lower sensitivities of 0.64 (95% CI 0.52 to 0.75) and 0.74 (95% CI 0.65 to 0.82), respectively. These results were mirrored in another meta-analysis by Zhang et al,10 which included 10 studies comprising 1724 patients and 2153 lesions, whereby magnified NBI for diagnosis of early gastric cancer had a pooled sensitivity, specificity and AUC of 0.83 (95% CI 0.79 to 0.87; I2=79.8%), 0.96 (95% CI 0.95 to 0.97; I2=89.3%) and 0.96 (0.93–0.98), respectively. NBI also has utility in identifying gastric preneoplastic lesions. Uedo et al37 reported that the presence of a light blue crest (see figure 1), seen with magnifying NBI, had a sensitivity of 89%, specificity 93% and accuracy of 91% in diagnosing intestinal metaplasia. NBI is generally used for lesion characterisation and not enhanced detection of gastric lesions. However, Ang et al12 have demonstrated, in a multicentre prospective randomised study involving 579 patients, that NBI detected more focal gastric lesions as compared with high-definition WLE (40.6% vs 29%, p=0.003), as well as a greater proportion of intestinal metaplasia (17.7% vs 7.7%, p<0.001). On a similar note, Tongtawee et al's38 study of 200 patients demonstrated that NBI also reliably identifies gastric mucosal morphological patterns associated with H. pylori infection, which correlated significantly with severity of pathological inflammation grading. A subsequent randomised study39 on 500 subjects noted site-specific biopsy guided by NBI had higher yield of diagnosing Helicobacter, as compared with standard WLE biopsy. Findings by Ang and Tongtawee suggest that NBI would be useful to identify sites for high-yield targeted biopsies. Light blue crest sign indicating gastric intestinal metaplasia on magnifying NBI. NBI, narrow band imaging. Of worthy mention, BLI is a new computer chromoendoscopy method developed by Fujinon, Fujifilm Medical Company, which uses two lasers; one at wavelength 450 nm, to irradiate white colour illumination, and the other at 410 nm, to enhance surface microvasculature patterns.40 Although there are few prospective studies evaluating the utility of BLI in gastric cancer screening, BLI has been shown to provide excellent endoscopic images to better characterise gastric lesions. The BLI-bright mode is the main highlight of this new technology, which allows for vascular contrast detection from a far view, thereby enabling its application in screening endoscopy; Kaneko et al41 demonstrated that BLI-bright mode compared with NBI had appreciable vascular-mucosal contrast from a significantly further distance (26.8 mm vs 16.4 mm, p=0.03), among 14 patients with gastric adenoma. Of note, six of 14 patients with gastric adenoma were identified with BLI at observed distance of 40 mm compared with only one of 14 patients with NBI. Dohi et al42 further validated the utility of magnified BLI in a prospective study of 132 patients; the 127 gastric lesions (of which 34 were histologically proven gastric adenoma) were first identified by WLE, and further characterised using magnified BLI, whereby magnified BLI, compared with WLE, had greater accuracy (92.1% vs 71.7%) in identifying gastric adenoma with sensitivity 93.8%, specificity 91.6%, positive predictive value 78.9% and negative predictive value 97.7%. Confocal laser endomicroscopy (CLE) produces high-magnification histological-like images through measuring the gastric tissue reflectance as a low-power laser is used during endoscopy for illumination. CLE may be applied during real-time endoscopy through either using additional probes or dedicated endoscopes with integrated CLE systems. A recent meta-analysis43 performed on CLE and gastric diseases, focused on three domains: (1) detection and diagnosis of polyps and neoplastic lesions (three studies, sensitivity 85% (95% CI 78% to 91%, I2=52.3%), specificity 99% (95% CI 98% to 99%, I2=92.92%), AUC=0.929), (2) gastritis and gastric metaplasia (six studies, sensitivity 94% (95% CI 92% to 96%, I2=54.8%), specificity 95% (CI 92% to 97%, I2=55.6%), AUC=0.983) and (3) H.pylori-related gastritis (two studies, sensitivity 86% (95% CI 76% to 93%, I2=0), specificity 93% (95% CI 87% to 97%, I2=2.6%)). The pooled analyses demonstrated CLE yields remarkable sensitivity and specificity, in per patient analysis in all three domains. However, the data were based on a limited number of publications. CLE also allows for targeted biopsies of specific pathological mucosal area, whereby Li et al44 demonstrated that CLE with targeted biopsies is superior to WLE for the detection and surveillance of gastric intestinal metaplasia. The number of biopsies needed to confirm gastric intestinal metaplasia is a third of that needed with WLE. Furthermore, CLE-guided biopsy boasts a higher diagnostic yield for gastric intestinal metaplasia (65.7%), compared with WLE (15.73%; p<0.001). In our local experience,45 we compared the diagnostic performance of WLE, AFI, magnified NBI and CLE for the diagnosis of gastric intestinal metaplasia in 20 patients, examining a total of 125 sites. We found that real-time CLE (88% 95% CI 89.8% to 98.2%) had better accuracy compared with conventional WLE (64.8%, 95% CI 55.7% to 73.1%), AFI (68.8%, 95% CI 59.9% to 76.8%) or magnified NBI (84.8%, 95% CI 81% to93.1%). Off-site review of CLE images further significantly increased the accuracy (95.2%, 95% CI 89.8% to 98.2%, p=0.012) of gastric intestinal metaplasia diagnosis (figure 2). 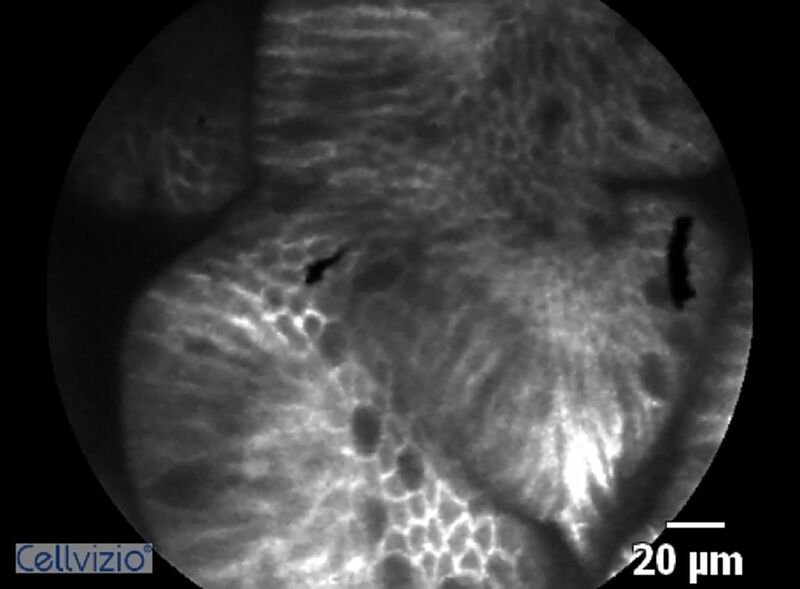 Gastric intestinal metaplasia as seen on confocal laser endomicroscopy. Experience and training greatly affect CLE interpretation.46 We reported that interpretation of CLE images of gastric intestinal metaplasia by experienced endoscopists was associated with higher sensitivity (95.2% vs 61.9%, p=0.039) and higher specificity (93.3% vs 62.2%, p<0.001) than interpretation by inexperienced endoscopists. The agreement between interpretation by experienced endoscopists and histology for gastric intestinal metaplasia was also higher than that for inexperienced endoscopists (K=0.864 vs 0.217). Pittayanon et al47 demonstrated that trainees with no experience in intestinal metaplasia interpretation could achieve high reading accuracy and substantial interobserver agreement after training with 10 sets of CLE video clips. Trainees on achieving high reading accuracy were shown to maintain their high quality of reading skill. Similar findings were noted by Kobayashi et al48 for CLE diagnosis of gastric cancer, whereby correct WLE interpretation and adequate training in WLE was identified to be the most important factor in achieving highly accurate diagnoses of gastric cancer using CLE. Endocytoscopy (ECS) is an ultrahigh magnification technology to enable histopathological diagnosis of the gastrointestinal tract, whereby the magnification lens of a conventional endoscope is gradually increased to visualise the gastric mucosal after an application of methylene blue and crystal violet staining. ECS has been shown to have high diagnostic accuracy (sensitivity 86% specificity 100%) for gastric cancer. However, in this study, 10 of the 82 lesions investigated could not be clearly observed by ECS due to poor staining due to viscous mucus or plaque.49 Sato et al50 further demonstrated that ECS could differentiate between normal antrum mucosa and preneoplastic changes, whereby they were able to identify four different mucosal patterns in the antrum in a small single-centre pilot study consisting of 64 patients, where the positive predictive values for associating type 1 pattern for normal mucosa and type 4 pattern for gastric intestinal metaplasia were both 100%. Polarimetry measures polarisation properties of light beams within the gastric mucosa, whereby it has been proposed to differentiate between normal, dysplasia and cancer. Wang et al56 first demonstrated differences in polarisation parameters, at low magnification, between normal and cancer gastric samples obtained from 20 patients; whereby a combination of polarisation parameters (linear depolarisation and linear retardance) had up to 95% specificity and 95% sensitivity. Subsequent Wang et al57 demonstrated the potential of polarimetry imaging for gastric tissue diagnosis at the microscopic level, whereby polarimetry was used to diagnose between normal gastric tissue, intestinal metaplasia, dysplasia and cancer, in a total of 84 samples for 59 patients. The accuracy of classification in digital staining using polarimetry imaging on the microscopic level varied from 56–75% for the discrimination of cancer, dysplasia and intestinal metaplasia or normal tissue. With further advances in polarimetry imaging, polarimetry is a promising technique with potential application for endoscopic imaging, such to allow for real-time diagnosis during endoscopy. Early detection of gastric preneoplastic lesions allows early treatment and leads to better prognosis. Table 1 provides a summary of the enhanced imaging modalities discussed in this review. Building on Muto et al's MESDA-G algorithm, we recommend the use of WLE, in particular HD-WLE, for the detection of suspicious gastric lesions. The demarcation line and subsequent microvascular and microsurface pattern should then be characterised using magnifying NBI or chromoendoscopy. These enhanced imaged modalities will also direct targeted biopsies. The technological advancements in field of endoscopic imaging for gastric lesions are fast growing. Recognition of the various endoscopic appearances of gastric preneoplastic and neoplastic lesions remains the fundamental first step which allows for subsequent early detection and more accurate characterisation, underlining the importance of training. Contributors JWJL was charged with acquisition, analysis and interpretation of the literature review, thereby drafting the work. LGL and KGY revised it critically, and have the final approval for publication.